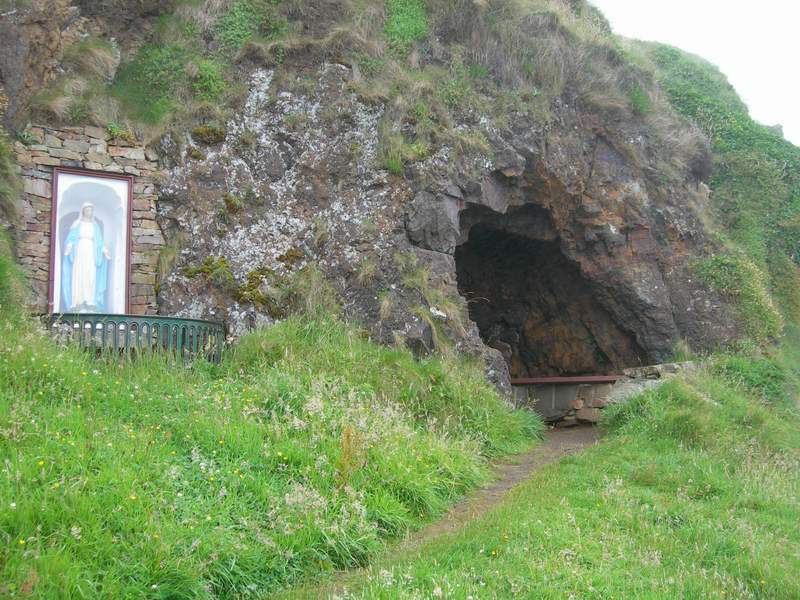 The Wee House of Malin is a hermit's cave situated on the seashore near Malin head. There is beautiful pebble beach, cliffs and other interesting rock features at the cave. The Wee House of Malin is a small cave below the shore cliffs. The legend goes that once a hermit lived there and that no matter how many people enter the cave there will always be room. The "Saint" venerated was St.Muirdhealach. Nearby is the ‘Malin Well’ or ‘St. Moriallagh’s Well’ (located in a cavern underneath the large rock directly in front of the ruins of the church) where on August 15th a pattern called Malin Well Fair is held. Beside are the remains of an old church which according to tradition was built by St Muirdealach (each source provides different spelling, but of course it is the same person). Built of split stone rubble and some boulders, only the NE and S walls now survive. Malin Head is Ireland’s most northerly point on the Irish mainland. The approach of Malin Head affords magnificent and dramatic views of the coastal scenery along the well signposted ‘Atlantic Drive’. You can also find another geocache Malin Head Irelands northern most cache there. There has been a long association between Malin Head and the reporting of the weather. 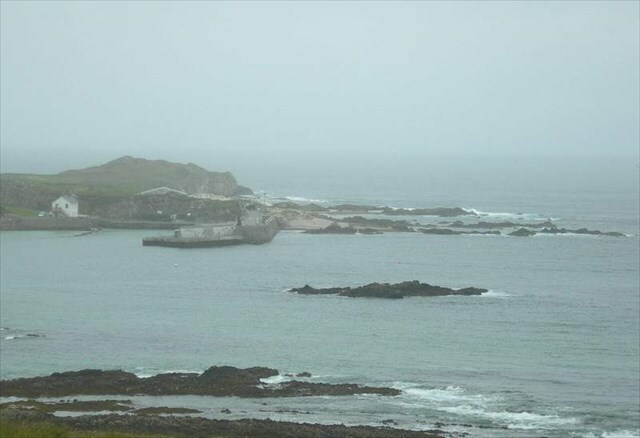 Weather reports which were so important to local and international shipping were first recorded at Malin Head in 1870 and the tradition of weather watching is still important in these parts with the location of the present weather station at Malin Head transmitting information for the Shipping forecasts. In 1902 the Marconi Company succeeded in sending the first commercial message by wireless from Malin Head to the ship S.S. Lake Ontario thus establishing Malin Head as an important staging post for future trans-Atlantic communication, however the Post Office took over from the Marconi Company in 1910. If you walk a bit further west along the seashore from the cave, you can see the Portmore Pier on the opposite shore. This is a very important place for geodesy, as it is the location of Malin head vertical datum, the base point of the levelling system in Ireland. This is fixed as Mean Sea Level of the tide gauge at Malin Head. It was adopted as the national datum in 1970 from readings taken between January 1960 and December 1969. All heights on National Grid mapping since then are in International metres above this datum. Earlier maps (e.g. County Series) used the low water mark of the spring tide on the 8 April 1837 at Poolbeg Lighthouse, Dublin. Initially fixed for County Dublin, it was adopted as the national datum approximately five years later. Heights above this datum were given in (Imperial) feet. Malin Head datum is approximately 2.7 m above the Poolbeg Lighthouse datum. We tried to search for the basepoint, but it was not so easy. The main point should be hidden in a small hut, which is now in the middle of the pier, but was once at the end of the old pier. Further there should be some reference points nearby, but we couldn't idetify clearly any of these. You can find basic data about the Malin head vertical datum here. To the north you can see small island with a lighthouse. It is Inishtrahull Island, the most northerly island of Ireland and home to the most northern Irish lighthouse. The island is now uninhabited but had a resident community until 1929 and a lighthousekeepers until 1987. There is also a geocache on the island. The cache is placed near the Wee House of Malin. You can follow the signpost and turn from a local road to a small steep road, which leads directly to the cave. 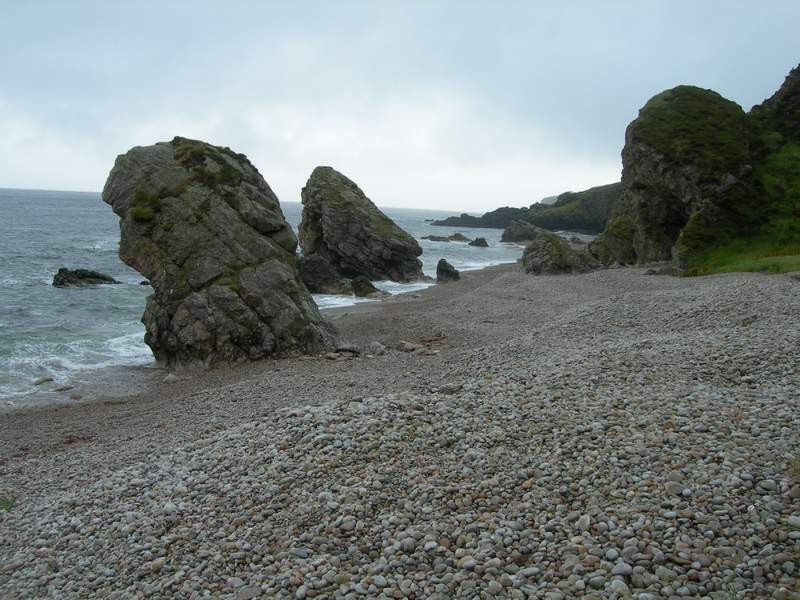 Then it is only a short walk to the cache, but it includes some walking on the pebble beach, so sturdy shoes are recommended. The cache is placed at the foot of the cliffs, do not approach from the top! The cache has been adopted from Ospo.